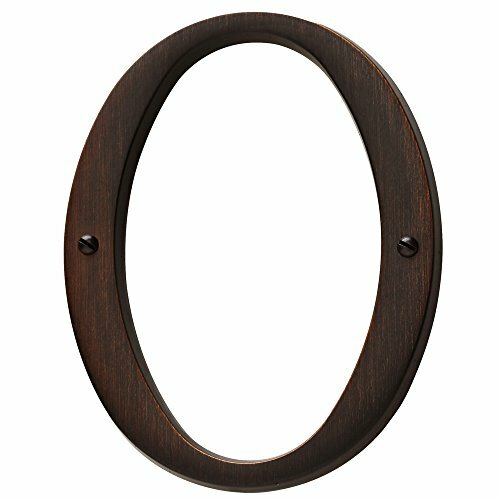 Baldwin Estate 90670.112.CD Solid Brass Traditional House Number Zero in Venetian Bronze, 4.75"
90670.112.CD Finish: Venetian Bronze, Number: Zero Features: -Construction: Solid brass. -Applied with truss head wood screws. -Petite size. Product Type: -Letter/Number. Plaque Shape: -Novelty. Theme: -Classic/Decorative. Size: -Petite. Primary Material: -Brass. Dimensions: Overall Height - Top to Bottom: -5". Overall Width - Side to Side: -4.7". Overall Depth - Front to Back: -0.31".